When your furnace stops working in the middle of a cold, winter night, what should you do? If you live in Philadelphia, Delaware or Bucks County, you call AJM, that’s what! We go above and beyond to make sure you’re comfortable, for the right price. Before we start any maintenance or repair work, we thoroughly explain whatever issue is at hand as well as your options, so you can make an educated decision on how you’d like to proceed. If the fan doesn’t respond when you raise the thermostat, the wiring could be loose, a breaker might have tripped, or the furnace switch might be turned off. However, it might be something more complicated like trouble with the thermostat, control board, transformer, run capacitor or blower motor. One of our technicians can perform a diagnostic test to identify the exact problem and resolve it. If you hear hissing or squeaking and squeals from your motor, then it’s probably about to fail. Immediate maintenance from one of our technicians can save your furnace from breaking down completely. Furnaces with spark ignitions make rapid clicking sounds when the burner is attempting to ignite. Failure to ignite might be due to a blocked flue, faulty control board or improper limit control. Replacing or repairing these parts can resolve this issue. Burners that don’t stay lit are usually caused by dirty flame sensors or clogged condensate drains. If the burners don’t light at all, the gas supply might be cut off. Some minor cleaning along with making a few adjustments should do the trick. If the blower doesn’t turn on after the burners ignite, then your run capacitor or motor requires attention. If the blower motor is running all the time, your air filter is the probably clogged. The restricted airflow might have damaged the limit switch, which senses the internal furnace temperature. Our technician can replace the switch and teach you how to change your air filter. 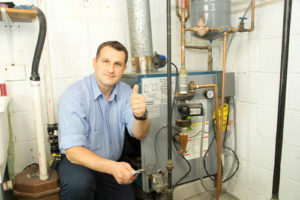 Our experienced team here at AJM is fully licensed and insured to repair and maintenance all furnace brands. You can rest assured that our technicians can complete your furnace repair or furnace installation correctly the first time. If you live in Philadelphia, Bucks County or Delaware and you’re having any trouble with your furnace, please call 215-398-4811, and we can schedule an estimate!